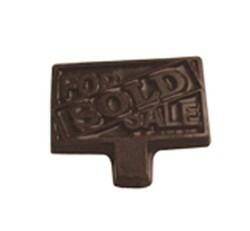 Custom molded solid chocolate candy "for sale/sold" real estate sign, foil wrapped with imprinted label applied to foil. Product also available in cello bag tied with ribbon for an additional $0.86 (R). Makes a great food gift or household and family or realtor promotional giveaway.